1. Incorporate more vegetables in your diet, to get more nutrients and fiber. 2. Create foods that are friendly for all kinds of diets. 3. Get kids to eat more veggies…willingly. 4. Help the environment (and local farmers). 5. Make meals fast, easy, and stress-free. Which Spiralizer is Best for You? Vegetable noodles are the way to go for healthy, low-carb meals! Get inspired by these best spiralizers that’ll turn you into a lean, mean, gluten-free noodle whirring machine. From Kitchenaid, OXO, Paderno, you name it! Read why this is the #1 pick, or go for this handheld budget alternative. 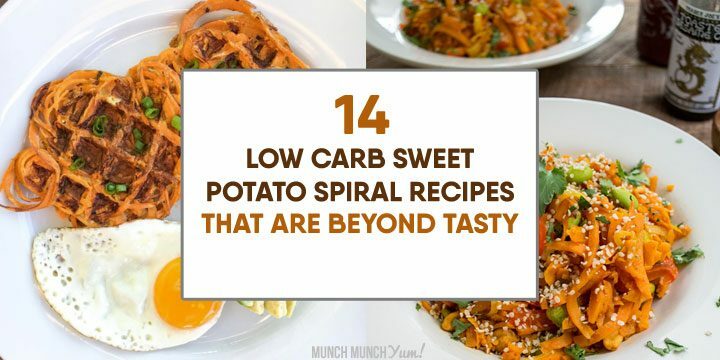 Did you know that you can create a low-carb, super-healthy alternative to traditional pasta using vegetables like zucchinis, carrots, and sweet potatoes? Finding recipes for these vegetable noodles is the easy part, but buying the right tools to make them is trickier. Here’s the lowdown on everything you need to know when it comes to choosing a spiralizer and which ones will give you your money’s worth. Read on to see the best spiralizers to give a whirl! If you’re like most people, you probably love pasta. But pasta can be loaded with carbs and if you’re on a low carb diet, you can easily go over the amount you’ve allotted for your daily eating plan. With the right tools though, you can make a healthy alternative to those traditional high carb pastas that aren’t good for you. By using a spiralizer, you can easiliy create great tasting pastas that are big on taste but low on carbs. A spiralizer is a kitchen tool that helps you cut vegetables into a ribbon- or noodle-like shape so that you can eat them as you would normal pasta noodles. Each spiralizer will offer its own set of features that will give you slightly different results, but their main function is the same: to help you easily create more visually-appealing vegetable noodles is a way that is not possible with traditional kitchen implements. Using a spiralizer and adding vegetable noodles into your diet has a whole list of benefits. Vegetables are a wonderful source of nutrients and fiber, making them vital to achieving healthy weight loss and maintaining good health. Finding novel ways to eat your fruits and vegetables makes it much easier to integrate them into your diet. A spiralizer helps you do exactly that. Most people start off learning how to make zucchini noodles, then branch off to try other ingredients, like beet or butternut squash recipes. As with any goal you are trying to achieve, the more obstacles you have in your way, the easier it is to slip up or just give up altogether. Vegetable noodles can be made without spiralizers, but having a spiralizer handy definitely reduces the amount of effort and time you need to invest, making it more likely that you will follow through on your intentions to eat the vegetable noodles more regularly. Sometimes having dietary restrictions or preferences can feel limiting. Luckily, vegetable noodles are very allergen-friendly, making them versatile for a wide variety of diets, including gluten-free, vegan, vegetarian, paleo, and keto, just to name a few. Another major plus of having a spiralizer is that it makes vegetables more fun for kids. There are even some spiralizers that are safe enough that they can be used by children to help with meal prep. Kids tend to be more willing to try foods that they’re personally invested in, such as if they get involved with growing the food, picking it out at the grocery store, or helping out during the cooking phase. Regardless, kids and adults alike love novelty, which spiralized noodles definitely provide. Be sure to check out our tips on how to use a spiralizer for a few hacks and tricks to make the most of this kitchen gadget. Using a spiralizer can help you reduce your carbon footprint by encouraging you to eat more seasonally and locally. Many people become fascinated with trying out all kinds of different vegetables on their spiralizer, and the local farmer’s market is a great place to get fresh, unique produce to create delicious vegetable noodles. Spiralizers make meal prepping and meal planning super easy. Use one to quickly crank out a batch of noodles that you can quickly add sauce to and create a speedy, simple meal idea. Any leftover noodles can then be refrigerated and used throughout the week. There are two main types of spiralizers: hand-powered and electronic. 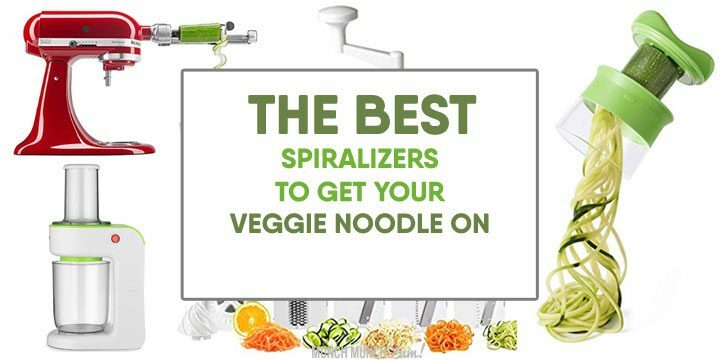 With hand-powered spiralizers, you insert your vegetable and then twist either that or the spiralizer itself to create the noodles. This means that you need to invest some manual labor to create your noodles, so if you are making a large amount of noodles or are using a tougher vegetable, it is possible that you will end up tiring yourself out. First, hand-powered ones typically are cheaper, which is always a plus. Second, hand-powered versions tend to be more compact, making them easier to store. In fact, some spiralizers are handheld-size, making them very portable and lightweight. An electric spiralizer is an actual appliance that you plug in and turn on to cut the noodles for you with little to no physical effort. Using an electric spiralizer will give you much faster and more uniform results. However, they do cost more than handheld spiralizers and take up more storage space. For someone who eats vegetable noodles regularly or makes large batches at a time, though, it is probably worth buying an electric spiralizer. Most electric spiralizers are standalone appliances, but some mixer brands do have spiralizer tools available that allow to utilize your mixer without have to buy a whole separate appliance just to make spiral vegetable noodles. If you have a Kitchenaid mixer, for example, you can purchase a separate spiralizer attachment package that fits with your existing mixer. Learning how to use your spiralizer is really easy, thanks to YouTube. Just enter your spiralizer’s make and model to find how-to videos showing you step-by-step instructions and important safety tips. Here’s a short video for our top spiralizer pick. Not all spiralizers are equal, so it is important to know what to look for when you are shopping for yours. For hand-powered spiralizers, you want to make sure that the part you will be cranking is comfortable and easy to grip. The amount of manual labor needed to make vegetable noodles with a non-electric spiralizer can surprise you, especially if you are making more than one portion, so consider if the grip looks like it will make your arms uncomfortable. Any handheld spiralizer that is meant to sit on a countertop while you use it absolutely must has good suction cups at the base. If you choose a spiralizer that has weak ones or, even worse, no suction cups at all, you’ll find that you waste a lot of physical energy when the spiralizer slides around, which can be aggravating. Different spiralizers come with different blade choices, so you have to consider if the appliance you are buying can make the noodles you want. You want to consider both the thickness of the noodle it can create as well as the shape – some blades create rounder noodles that are similar to spaghetti whereas other blades create noodles that are ribbon-like, akin to fettuccine or linguine. Speaking of blades, one advantage that electric spiralizers have over hand-powered ones is that electric spiralizers tend to have less of the blade exposed. This makes them safer to use, especially if you have kids who want to help out with the noodle-making. Size is another consideration because some people have limited kitchen space. Don’t just look at the main appliance itself; think about all the accessories and extra blade options that the spiralizer comes with because those have to get put away too! A final aspect to consider is the clean-up factor. The design of the spiralizer and its accessories will dictate how easy it is to clean. Fortunately, the spiralizer shouldn’t come in contact with anything fatty since you are only using the raw vegetable on it. Still, you want to make sure it is easy to disassemble, rinse, wipe down, and dry. Leaving moisture on the blades makes them more prone to rust, and having residual food pieces can be a food safety issue. If you plan to wash your spiralizer in the dishwasher, double check that the spiralizer you are considering is in fact dishwasher-safe. Our vote for the best spiralizer that has a good balance of all the traits you’d be looking for is the Oxo Good Grips 3-Blade Spiralizer. It comes with three blade sizes that can give you rounder noodle options that resemble spaghetti or wide ribbon-like strips. They even provide a little storage box for the blades, making it easier to keep track of and organize them. Most importantly, OXO made their base suction cup system a definite priority by having a large suction cup as opposed to several smaller ones, plus a handle to reinforce the seal. They took the number one complaint that people had about spiralizers, namely countertop slippage during use, and came up with a way to literally seal the deal. A helpful hint: a few users who had a particularly slippery type of countertop material found that slightly moistening the suction cup before engaging the mechanism eliminated any slippage. When assembling, be sure to snap the handle into place well in the beginning. Some users reported that the handle came off during use, but if you use a little force during the initial assembly, the handle should stay firmly in place. Unlike some other spiralizers, this one does not come with a vessel or compartment to catch the resulting noodles. However, we didn’t think this was a major setback because the chances are you’d be using a strainer or bowl during the course of making your meal anyway that can be used as the holding container. 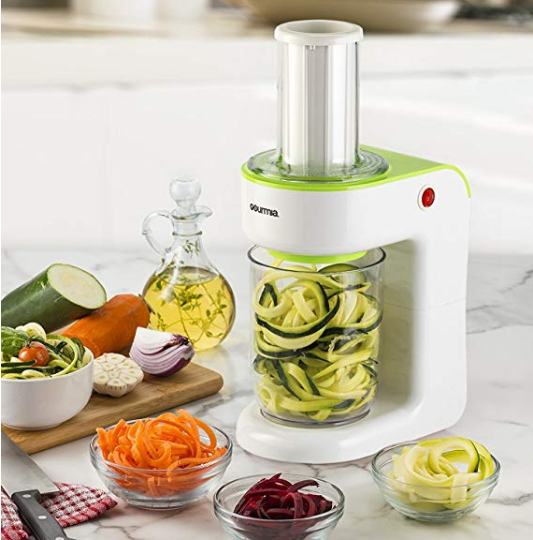 For those who want to splurge a little more to get an electric spiralizer, we recommend getting the Gourmia GS325 Electric Spiralizer & Veggie Pasta Maker. 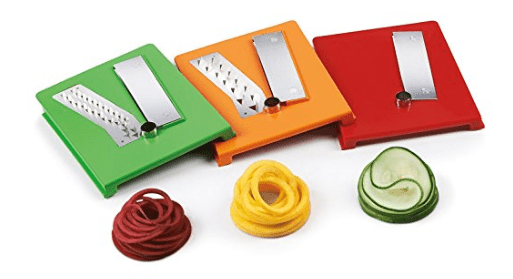 This spiralizer comes with three blades that allow you to create the three most common vegetable noodle shapes: spaghetti-like, fettucini-like, and ribbon-like. It also comes with a sturdy container to catch the noodles that come out, as well as a recipe book that includes ten dishes for you to try making. Many users have reported that because this spiralizer was so easy to use, their kids were delighted to join in and help with making noodles. Another pro that users cited was how well the various pieces fit together to make storage fairly easy. Keep in mind that the spiralizer comes with a safety feature that requires you to lock the pieces in place before it will run. Although some users complained that their machine didn’t work, this was most likely the main culprit because most people did not report any problems with getting their spiralizer to start up. OXO also takes our best pick in this category too with their Good Grips Handheld Spiralizer. You have the option of buying the simplest, one-blade version which is all you need to make vegetable noodles, or you can elect to buy a two-blade or three-blade option to give yourself more choices in terms of noodle shapes. Few spiralizers are able to beat the OXO Good Grips Handheld Spiralizer in terms of compact size. The ultra-compact design with nestled blades means it takes up very little storage space. If you eat vegetable noodles only occasionally or only need to make vegetable noodles for one, you might not really need a full-sized countertop spiralizer. This is also a great option if you just aren’t sure yet how you feel about vegetable noodles and want to try it out first before committing to buying a larger, more powerful machine. The one downside about this spiralizer is that its instruction manual is very lacking. Fortunately, there are numerous online resources you can turn to for better directions. We recommend checking out this YouTube video for a concise explanation of the spiralizer’s various parts and step-by-step directions on how to use them. If you’re a complete newbie to this whole spiralizing thing and want to get your hands on a sturdy, quality machine without necessarily paying a higher price point for something top of the line, then this is a good one to break you in. The top-to-bottom design means less energy is needed and a greater ease of use. It also comes with a number of blades for different cutting thicknesses and designs. Few kitchen appliances have as devoted a cult following as the KitchenAid Mixer. If you are a proud owner of one, you may be happy to learn that there is a separately sold attachment package you can purchase to give your mixer the functionality of a spiralizer. The kit comes with four quick-change blades as well as a additional peeler blade, which is more than most standalone spiralizers offer. Because the attachments run off the mixer’s motor, it works like an electric spiralizer meaning you don’t have to work up a sweat hand-cranking the machine yourself. Regardless of which model you have, this kit is designed to fit all versions of KitchenAid stand mixers. The product is backed by KitchenAid’s 1-year warranty, and the attachments are also dishwasher-safe which makes clean up a breeze. There are three main cons with this product, the first being the high price. Virtually every other spiralizer (including electric ones) are much cheaper. And the price you’ll see is usually only for the attachments; it does not include the price of the mixer itself which is needed to actually use this attachment kit. A second major drawback is the high learning curve that some people reported. Few spiralizers have as polarized reviews as the KitchenAid spiralizer kit: there are many positive reviews but also many negative ones. This attachment kit definitely has more parts than any other spiralizer, so some found the assembly frustrating. If you decide to purchase the kit, it is absolutely essential that you check out a tutorial video online, such as this one. People also report that this kit ends up creating a lot of food waste. The peeler, for example, tends to take off more than is necessary. Also, one part of the mechanism is a skewer that is supposed to hold the food in place. Several users reported that the skewer didn’t always work properly, which results in the skewer destroying one end of the ingredient that otherwise didn’t have to be wasted. This reliable brand does side-to-side spiralizing. At first, it’ll take a bit more effort but it gets the job done and doesn’t take that long before you get the hang of it. The fact that there is a As Seen on TV spiralizer product proves just how popular vegetable noodles are. 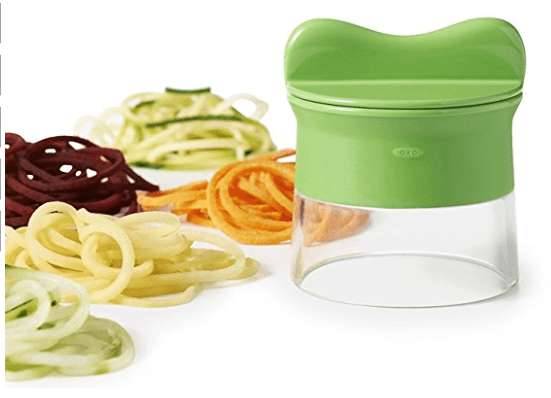 The Veggetti Ontel Spiral Vegetable Slicer is a handheld, manually-powered spiralizer that has the best price point of all the spiralizers covered in this post. Another big plus is how intuitive and easy it is to use. You literally just stick the vegetable into the opening and turn the vegetable to produce your noodles. The Vegetti has two built-blades of different sizes, so you don’t have to worry about storing and keeping track of separate blade pieces. The best way to decide which spiralizer to go with basically depends on what you think will be your greatest obstacles to buying one and being motivated to use it. 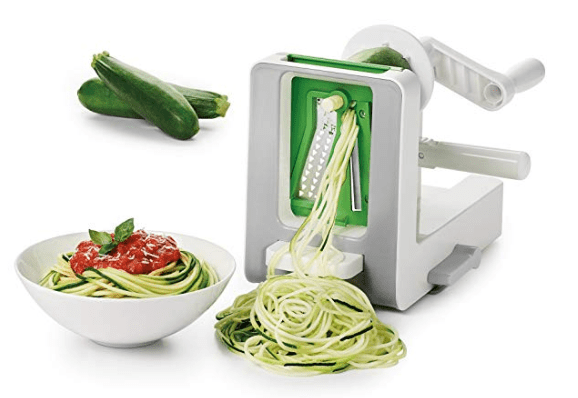 For example, if you have arthritis or dread the idea of physically cranking out lots of vegetable noodles, an electric spiralizer is definitely the way to go. 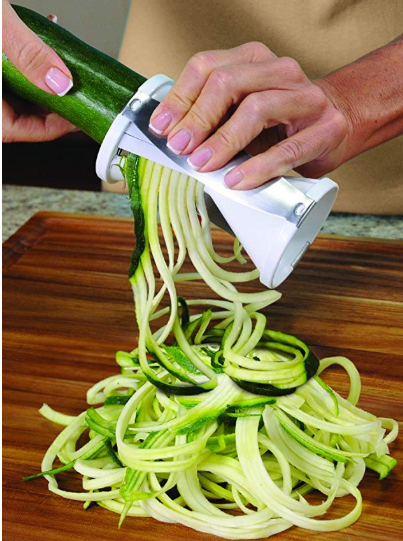 If cost or space size is your main limitation, a handheld spiralizer might be the best choice. All of the spiralizers we featured cater to different needs. 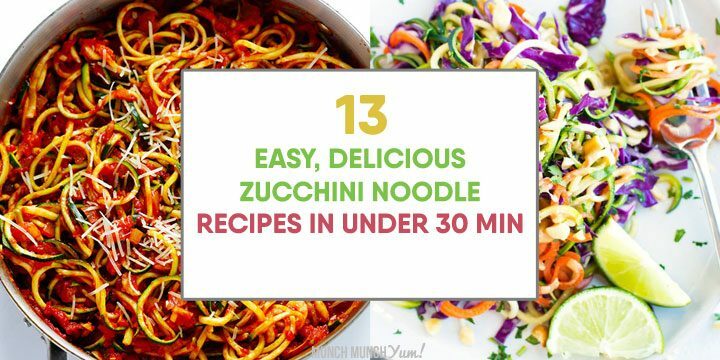 Between this article and our other informative and delicious spiralizer posts, you’ll have everything you need to make fun and tasty vegetable noodles!